Wheel’s mother made these a couple of Christmases in a row. And then cherry chips disappeared from the store shelves. Maybe it was a regional thing. But when I saw the package on the shelf a few weeks ago, I knew it was time for Cherry Mash Bars – Yay!!! 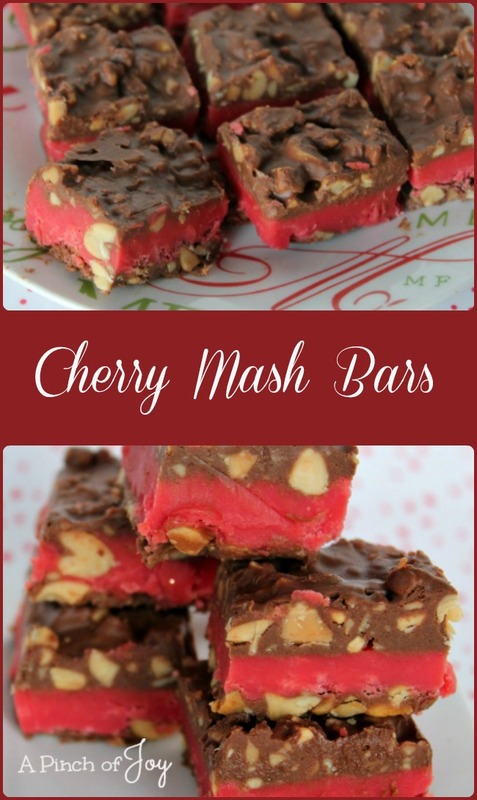 You can make Cherry Mash Bars with a layer of chocolate on the bottom AND on the top. To do this, divide the chocolate chips, peanut butter and nuts in half. Melt 1 cup chocolate chips, 1/3 cup peanut butter for 45 seconds in the microwave, add half the chopped nuts. Spread in foil lined pan. When cherry layer is completed, repeat for the second layer of chocolate. OR Alternatively, you can put the entire mixture of chocolate, peanut butter and nuts on top of the cherry layer just by following the instructions in the recipe above. Time wise, making one layer might be more efficient and quicker. Taste wise the chocolate envelopes the cherry with two layers. Take your pick. This time I was in a two layer mood, so that’s what you see. Note: This is intentionally a lower sugar version than the usual recipes, including the one on the back of the cherry chip package, in case you are comparing. I often automatically reduce the amount of sugar used, especially in recipes that have been around for a while. Many of the older dessert recipes list more sugar than we use today. They also specify smaller serving pieces. The recommended size for this recipe is 1 ½ inches by 1 ½ inches. Which is a good thing! Sweet cherry layer paired with chocolate and peanut butter with crunchy chopped peanuts -- mmmm! Line 9 by 13 pan with non-stick foil non stick side up and leaving a three inch overhang for a "handle" on each end. Spray with cooking spray, too. Add half the cherry chips and stir. Add vanilla and remaining chips. Beat until chips are fully melted and mixture is smooth. Measure chocolate chips and peanut butter into medium microwave bowl. Heat on high for 45 seconds. Remove from microwave and stir until chips and peanut butter are melted and smooth. Pour over chopped peanuts and stir until thoroughly mixed. Spread peanut mixture over the cherry layer. Chill candy overnight in refrigerator. Lift from pan by aluminum foil handles to cutting board. Slice in 1½ inch pieces with sharp knife and serve. Can be stored in airtight container and refrigerated or frozen. These look amazing! Thanks for sharing with us at the Funtastic Friday Blog Hop! Hope to see you there again soon! Thanks for sharing this yummy treat with us at Funtastic Friday Blog Hop! 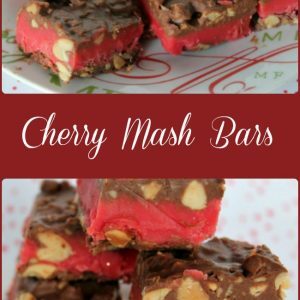 Your Cherry Mash Bars look fantastic and perfect for the holidays. We really appreciate you sharing with us at Full Plate Thursday and hope you are having a great day!